Were We Just Bystanders in Dog Domestication? Scientists used to think prehistoric hunter-gatherers created the dog by adopting wolf pups and breeding the friendliest of them, for centuries or longer. A more recent theory, however, suggests that humans served as little more than bystanders in dog domestication. The transformation from wolves was already complete, the theory goes, before the first dog-owners adopted their pets. The dog is a subspecies of wolf. Genetic evidence tells us that dogs were domesticated in East Asia during the Paleolithic—the Old Stone Age—roughly 15,000 years ago. Dog DNA also tells us that all dogs descend from the same three females, so domestication probably happened a single time. But how? Did camp wolves look like Tamaskan dogs? The traditional wolf-breeding theory has a problem. Why would anyone ever keep a wolf old enough to breed? It doesn’t matter how carefully you choose the friendliest wolf pup or how much you love and feed it; your pet will grow into a large, frequently sullen, occasionally vicious, and always dangerous predator. Have you ever seen a two-year-old grab a dog’s ears and pull, and cringed as the dog yelped, hoping Fluffy wouldn’t bite? How would you rate the child’s chance of survival if the ears belonged to a full-grown wolf? And keep in mind, these alleged wolf-breeders were hunter-gatherers, without tranquilizer guns, shock collars, choke chains, metal weapons, or even fences capable of restraining a wolf, so far as we know. 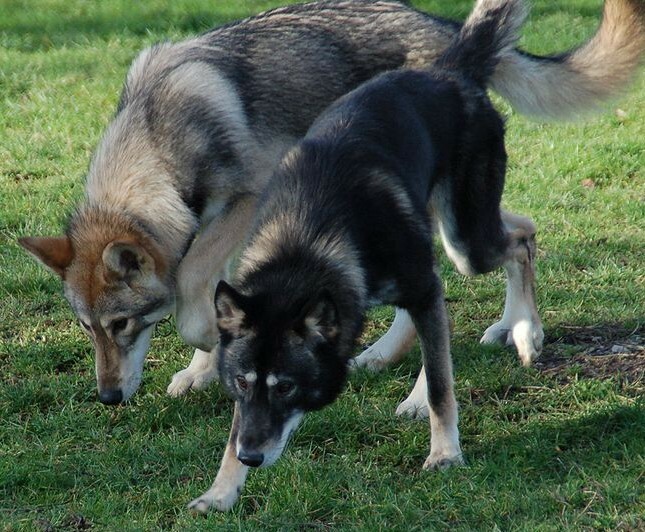 The newer theory avoids the wolf-breeding conundrum. The idea is that at some point, wolves began living near a human camp or long-term settlement to scavenge discarded meat. This “camp wolf” population faced a new selective pressure. The animals least afraid of humans would consistently reach the meat first, since they came closest to the humans tossing the scraps out of camp. So the camp wolves with the lowest “human avoidance” ate more, survived longer, and had more pups. That’s it: that’s the whole evolutionary story, just about. Selection for that one feature, low human avoidance, led to a cascade of other changes, including shorter noses, curled tales, floppier ears, patches of white fur, puppy-like playfulness, and a tendency to bark when excited, as well as a submissive, tail-wagging love for Homo sapiens, without a trace of wolfish dignity. That’s because the hormones governing avoidance also control these additional doggie traits—many of them features of juveniles that wolves grow out of, unlike dogs. In other words, the first dog-owners probably didn’t do any breeding. They may have adopted camp wolf pups and found they could trust their pets for life. Or the whole camp wolf pack may have moved into the settlement and become part of the human family. (The hunter-gatherers likely welcomed their new friends with open arms because—among other reasons—barking at nighttime noises provided a much-needed alarm system.) Either way, scientists think the process was fast. Selection for low avoidance may have produced dogs a century or less after the first camp wolves took up residence on the outskirts. Wild foxes don’t have these white patterns. This isn’t pure speculation. We’ve actually seen such a transformation. In 1959, the Soviet Institute of Cytology and Genetics began a multi-decade experiment with silver foxes, in Siberia. From a pool of foxes kept for fur, researchers bred the animals with the lowest human avoidance. After ten generations, the experiment had transformed a fifth of the foxes in an amazing way. They had shorter noses, curled tails, floppier ears, white patches in their fur, and puppy-like playfulness—and they had become submissive tail-waggers who love, love, love human beings. In other words, selection for low human avoidance had created a new dog-like creature. By 1996, the experiment had produced 700 foxes so tame that they make loyal and loving pets, unlike all other foxes worldwide. 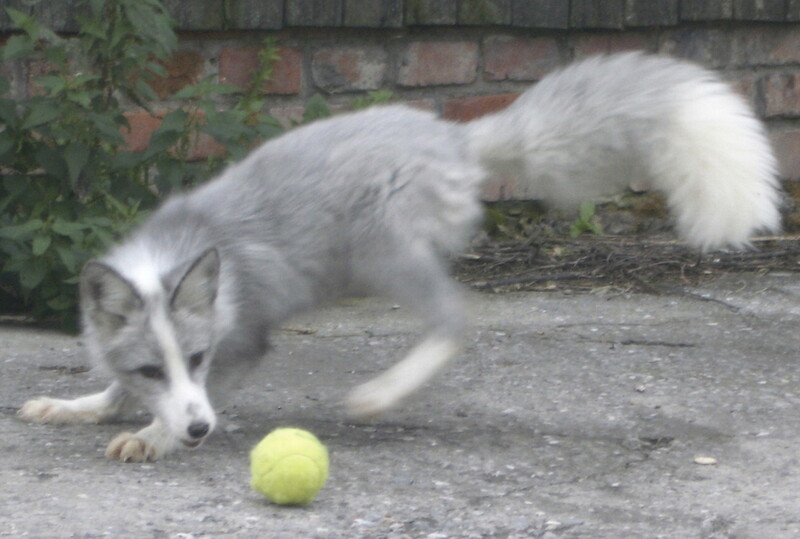 In fact, you can actually adopt one of these domesticated foxes (though the $7K price is a bit steep). All this wolf/dog/fox research comes to us with an interesting footnote. Modern humans are generally less aggressive than our Paleolithic ancestors, and we share many traits with the juveniles of earlier hominin species. Evolution may have domesticated us in the same way as the dog. Early Canid Domestication: The Farm-Fox Experiment, American Scientist (1999). Wade, Before the Dawn: Recovering the Lost History of Our Ancestors (2007): An absolutely fascinating account of human prehistory based largely on genetic evidence. The dog stuff is in Chapter 6 (Stasis). Dogs That Changed the World, PBS documentary and web journal. Photo 1: A cropped version of Timba+und+Dallas1, courtesy of Kirsten Dieks through Wikimedia Commons. Photo 2: Fox demonstrating some of the dog-like behaviors that characterize the tame population. © 2011 Cold Spring Laboratory Press. ← Is America Falling, Like the Roman Empire? A very enjoyable article. Dog traits have long fascinated me – and this is certainly an interesting perspective on how the true dog evolved. As a life-long dog owner, I appreciate the background studies! Thanks! Wonderful blog. Like Harry J., this is prompting me to log a first ever blog response. This post calls to mind Stephen Budiansky’s “Covenant of the Wild: Why Animals Chose Domestication,” which came out about ten years ago. It was an entertaining read, albeit more of an argument about carnivorism than a survey of the scientific literature. If I’m recalling correctly, the author’s primary point (or at least the editor’s push on the jacket cover) was that domestication is not something humans unilaterally imposed on animals. However horrified we may be of factory farms today, human-animal interdependence developed precisely because both sides benefited from the relationship. From what you’ve written about the speed and relative ease of the process with dogs, it’s interesting to think about just how little volition there may have been on either side, at least with respect to one species. Thanks, Laura and Jeff! Jeff, I think you’re right about animal-driven domestication. There’s certainly evidence the cat domesticated itself, hanging around early farmers’ storehouses to catch the mice attracted to the grain. (I’ll undoubtedly blog about this eventually.) And I’ve heard the same for other domestic animals, though I don’t know the mechanism. I’ve also heard your idea of interdependence–including the suggestion that human hearing and sense of smell are so bad because they weren’t selected for after dogs took over those functions for us. Wow, that fox sounds really neat. I’m surprised they aren’t more popular if they’ve been around for a while. My Dog is really dumb so I think her ancestors let their owners do the thinking for them. But she has a big heart so I’m saddened to think that her ancestor’s owners lacked heart and were really mean. I get the sense dogs have been selected more for big hearts than big brains. In fact, I think wolves are consistently smarter. Ah, well; we love our dogs anyway.